This 41mm. 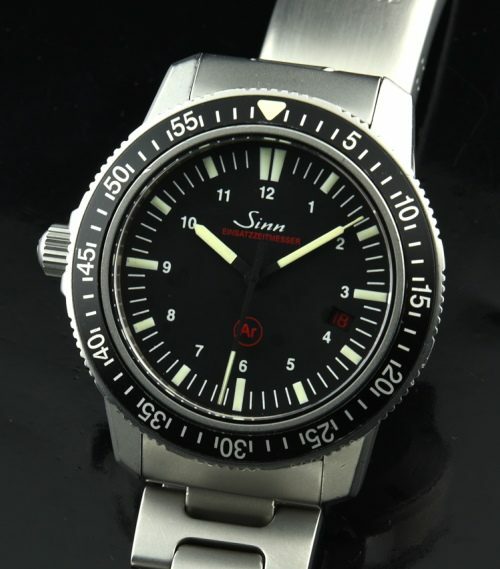 stainless steel SINN EZM3 is a beast of a watch! This is a true tool watch that can take whatever you throw at it. This watch is from the 2000’s and looks close to NEW. This watch has a screw-down crown, moisture valve, sapphire crystal, anti-magnetic case and left hand winder-all designed for professional diver or rugged use. The dial has such a “purist’s” layout-so simple to read and glows like mad. The watch is accurate after a cleaning. I’ve been wearing this for the past month on and off…I love it!